Here's hoping you stocked up on birthday cards in the sales because January is a bumper month for royal celebrations. There are kings, queens, consorts, heirs, spares and twins on the list of birthday royals for January with just about every week of the month already packed with cake and candles featuring regal monograms. Get the stamps ready, here are sixteen royal birthdays for January. Juan Carlos Alfonso Victor Maria was born on January 5th 1938 in Rome where his royal family was in exile. He was the second child and first son of Juan, Count of Barcelona and his wife, Maria de las Mercedes. Juan Carlos became King of Spain on the death of Franco on November 2nd 1975 and played a large part in the restoration of democracy to his country. He was a hugely popular monarch for many years but his standing took a downturn in the 2010s. On June 19th 2014 he abdicated in favour of his only son, now Felipe VI. Jean Benoît Guillaume Robert Antoine Louis Marie Adolphe Marc d'Aviano was born on January 5th 1921 in Luxembourg. He was the first child of Charlotte, who had become Grand Duchess of Luxembourg just two years earlier on the abdication of her sister, Marie-Adelaide, following political unrest. His father was Prince Felix of Bourbon Parma. Jean became Grand Duke of Luxembourg in 1964 on the abdication of his mother and ruled until 2000 when he stepped aside in favour of his eldest son, Henri. He now lives in Fischbach Castle. Denmark's royal twins were born on January 8th 2011 at the Rigshospitalet in Copenhagen. Vincent Frederik Minik Alexander arrived first with Josephine Sophia Ivalo Mathilda born 26 minutes later. The youngest children of Crown Prince Frederik and Crown Princess Mary of Denmark, Vincent and Josephine are fourth and fifth in line to their country's throne respectively. They live with their parents and older brother and sister, Christian and Isabella, in Copenhagen where they attend school. Guess whose royal birthday will be getting the most attention this month? Catherine Elizabeth Middleton was born on January 9th 1982 at the Royal Berkshire Hospital in Reading, the first child of Michael and Carole Middleton. 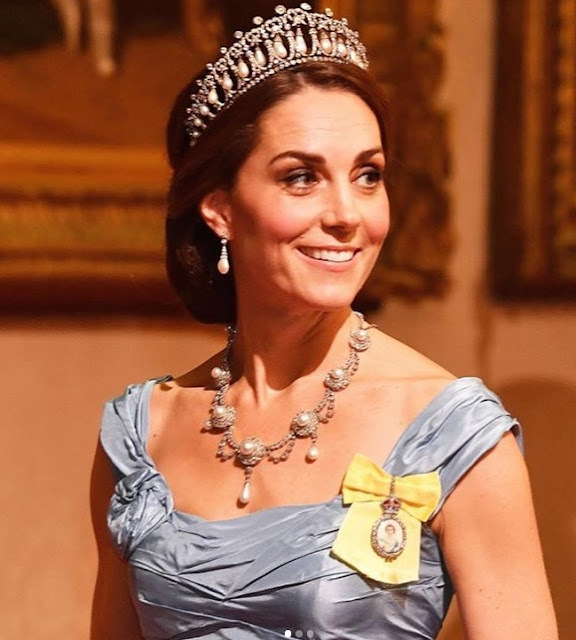 She grew up in Berkshire and studied History of Art at St Andrew's University where her relationship with Prince William, second in line to the throne, began. The couple married on April 29th 2011 and now have three children. Oh, and Kate is really rather famous around the world. Easily winning the most cards competition in this royal line up. Claire Louise Coombs was born in Bath on January 18th 1974 to a British father, Nicholas Coombs, and a Belgian mother, Nicole. She moved to Belgium with her family in 1977 where she was educated. She became a land surveyor before marrying Prince Laurent, the youngest son of the then King of the Belgians, Albert II, and his wife, Paola. The couple have a daughter and twin sons. Margriet Fracisca was born on January 19th 1943, the third child Juliana of the Netherlands who was living in Canada at the time because of the Nazi occupation of her country, Margriet, whose father was Prince Bernhard of the Netherlands, arrived at the maternity ward of Ottawa Civic Hospital which was temporarily placed outside of Canadian jurisdiction so that the new royal baby could claim Dutch citizenship. Margriet returned to the Netherlands with her family in 1945 where she was educated - her mother took the throne in 1948. She married her university sweetheart, Pieter van Vollenhoven in 1967 and they now have four sons and eleven grandchildren. Margriet continues to carry out engagements for the Dutch Royal Family and is now eighth in line to the throne. Birgitta Ingeborg Alice was born on January 19th 1937 at the Haga Palace in Stockholm, the second child of Prince Gustav Adolf and his wife, Princess Sibylla. Her father was then second in line to the Swedish throne but as a girl, Birgitta had no succession rights. Soon after the birth of her only brother, Carl Gustaf, in 1947, Birgitta's father died in a plane crash. Carl Gustaf was raised to be king and succeeded his grandfather in 1973. Birgitta was the only one of Gustaf Adolf and Sybilla's children to marry royalty - her husband was Prince Johan Georg of Hohenzollern who died in 2016. The couple had three children and six grandchildren. Birgitta now lives in Spain. Mathilde Marie Christiane Ghislaine d'Udekem d'Acoz is the first Belgian born queen of her country in its history. The daughter of Patrick and Anna Maria d'Udekem d'Acoz and was born in Ukkel on January 20th 1973. The eldest of five children, she was educated in Brussels where she became a speech therapist before her surprise engagement to Philippe, then heir to the Belgian throne, was announced in September 1999. The couple married in the last big royal wedding of the 20th century, on December 4th 1999, and had four children before Philippe became King of the Belgians on July 21st 2013 following the abdication of his father, Albert II. Sophie Helen was born on January 20th 1965 in Oxford, the second child and first daughter of Christopher and Mary Rhys-Jones. She grew up in Kent where she went to school and established a career in PR which continued after her marriage to Prince Edward, the youngest son of Elizabeth II and the Duke of Edinburgh on June 19th 1999 at Windsor. The couple became Earl and Countess of Wessex on their wedding day. Sophie quit her career in 2002 and now takes on a substantial number of public engagements every year. The Wessexes have a daughter and a son and the family lives in Surrey. Ingrid Alexandra, future queen of Norway, was born on January 21st 2004 at the Rikshopitalet in Oslo. She was the first child of the marriage of Crown Prince Haakon Magnus and Crown Princess Mette-Marit and second in line to her country's throne from birth. She lives with her parents and siblings in Oslo where she attends school. She is in line to become Norway's second queen regnant. Caroline Louise Marguerite was born at the Prince's Palace in Monaco on January 23rd 1957 and immediately became one of the most famous babies in the world. She was the first child of Prince Rainier III of Monaco and Grace Kelly who had married in a star studded ceremony the year before. Caroline went on to marry three times herself . She had three children with her second husband, Stefano Casiraghi, and a daughter with her third husband, Prince Ernst of Hanover. She was briefly heir to Monaco's throne between her birth and the arrival of her brother, Albert, in 1958, and held the same position for the first nine years of her brother's reign. Princess Athena Marguerite Francoise Marie, tenth in line to the throne of Denmark, was born on January 24th 2012 at the Rigshospitalet in Copenhagen. She is the second child of Princess Marie with her husband, Prince Joachim, who also has two sons from his first marriage. Athena lives with her parents and older brother, Henrik. Charlene Lynette Wittstock was born on January 25th 1978 in Bulawayo to Michael and Lynette Wittstock and moved with them and her two younger brothers to South Africa in 1989. She became an Olympic swimmer and won a silver medal at the 2002 Commonwealth Games. She married Prince Albert II of Monaco on 1st and 2nd July 2011 and the couple have twins, Jacques and Gabriella, born on December 10th 2014. Felipe Juan Pablo Alfonso de Todos los Santos was born in Madrid on January 30th 1968, the third child and only son of Juan Carlos and Sofia, later King and Queen of Spain. He was educated in Spain and the United States and formally created Prince of Asturias in 1977. He married Letizia Ortiz Rocosolano on May 22nd 2004 and the couple had two daughters, Leonor and Sofia, before Felipe became King of Spain on the abdication of his father on June 19th 2014. Beatrix Wilhelmina Armgard was born on January 31st 1938 at the Soestdijk Palace in Baarn. She was the first child of Juliana, then heir to the throne of the Netherlands, and her husband, Prince Bernhard. She became heiress to the throne in 1948 when her grandmother, Wilhelmina, abdicated in favour of her mother. Beatrix married Claus von Amsberg in 1966 and the couple had three sons. Beatrix became Queen of the Netherlands in 1980 on the abdication of her mother and days before her 75th birthday, in 2013, she announced her own intention to stand aside in favour of her son, handing over the throne to Willem-Alexander on April 30th that year. She now lives in Drakensteyn Castle.